In 2014 we’ll be celebrating the half-century anniversary of a legendary Renault, the R8 Gordini. The “R8 Gorde”, with its characteristic twin white stripes, took over from the Dauphine Gordini in 1964, and very soon won the hearts of sports-minded motorists everywhere. With New Twingo raising eyebrows over its rear-mounted engine architecture, we recall how Renault 8 Gordini surprised the motoring world by carving out a place for itself in what seemed the inapproachable arena of motor sports. 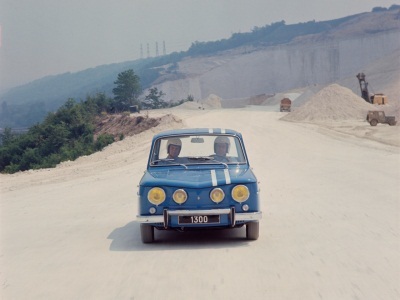 Visitors to the Paris Motor Show in October 1964 were fascinated by a small blue car with two white stripes, priced at just 11,500 francs, yet boasting the quite impressive performance of 170 km/h top speed and 33 seconds to reach 1,000 metres from standstill. These were the appealing specifications behind a car that would go under the affectionate nickname of “La Gorde”. The Renault 8 Gordini, derived from the production R8 released two years earlier, was a sports model powered by the 1108 cc engine, but with power boosted up to 95 bhp SAE by means of a cross-flow cylinder head and twin twin-choke side-draft carburettors. Encouraged by successful take-up of the 1100 version, production of which totalled 2,626 units, Renault followed through with a 1300 version in 1966. The new Renault 8 Gordini was instantly recognizable with its four headlamps, and packed some serious upgrades, starting with a 1255 cc engine developing 110 bhp SAE (88 bhp DIN) at 6750 rpm, a five-speed gearbox, and a 26-litre additional fuel tank in the front trunk. Throughout its career, this version would delight some 9,000 happy customers. The R8 Gordini, built for competition, would prove its worth on its very first official outing, in the 1964 Tour de Corse. The competition was daunting, and the weather conditions appalling. Of the 79 cars at the starting line, only eight appeared in the final ranking. The Renault 8 Gordini made a staggeringly impressive entry into the world of motor sport by taking first, third, fourth and fifth places. This fantastic feat would be followed by many others, for both Renault and its delighted customers, in France and elsewhere. Perhaps the most emblematic statement of the car’s sporting talent came with its three successive Tour de Corse victories, in 1964, 1965 and 1966. On G-Day —19 July 1970— Gordini, Dauphine and Renault 8 owners were invited to the Castellet racetrack for what we might call the automotive equivalent of Woodstock. Amédée Gordini was there in person, along with a host of racing drivers, for a most memorable motoring meeting, centrepieced around presentation of the brand new Renault 12 Gordini, now a front-wheel drive model. This mammoth festival attracted more than 2,000 vehicles from all over Europe to take part in the first motor sports meeting at the Paul Ricard racetrack! To celebrate the 50th anniversary of this legendary car, Renault Classic has entered five Renault 8 Gordinis in the 2014 Monte-Carlo Historic Rally. One of them will be driven by the no less legendary rally driver Jean Ragnotti, always there to lend a hand with motor sport festivities. The public at large recently enjoyed an opportunity to admire five models from the Renault Classic collection at the Paris Retromobile Show, at a stand decked out in Renault 8 Gordini anniversary colours.